This summer in Danmark my uncle uncharacteristically pulled out a non-pilsner while we were having happy hour. The moment my eyes spied the bottle the part in my brain devoted to cool design lit up. The whole bottle except for the lip is coated in white and the label has a strange seal/pig/submarine animal wildly catching snowflakes on its tongue. Catching snowflakes with vigor. Deadly vigor. 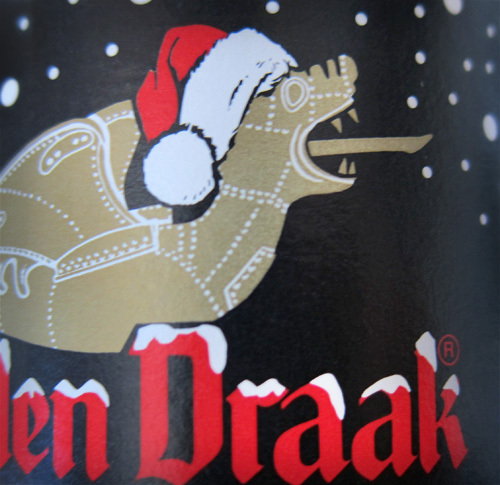 My dear old dad saw the halo of design joy surrounding this bottle, and took the bottle home with him so that this Christmas, what was waiting for me under the tree? 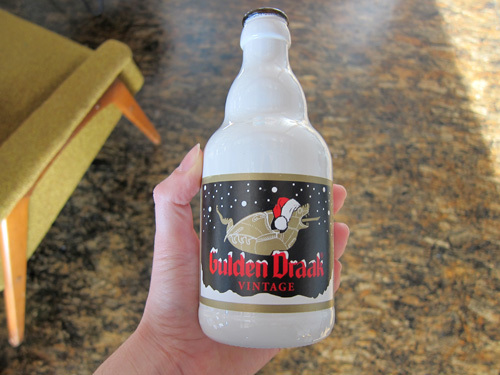 Gulden Draak Vintage! If any a bottle were to get me to drink beer, this would be it. As the Danes would say: skål!